Researchers at the Van Andel Insititute in Grand Rapids, Michigan have published a research report that has garnered a lot of media attention. You may have heard about it. It involves Parkinson’s and the appendix. They found – using two independent databases – that the removal of the appendix dramatically reduces one’s risk of developing Parkinson’s. In addition, they also found that the healthy (non-Parkinson’s) human appendix has an abundant supply of the misfolded version of the Parkinson’s-associated protein alpha synuclein. In today’s post, we will look at what the appendix is, what this new research report suggests, and explain why you should not rush out to get your appendix removed just yet. I recieved a curious email last night. Should I have my appendix chopped out? Direct and to the point. The way I like things. Today’s post is my response to that email. Authors: Killinger BA, Madaj Z, Sikora JW, Rey N, Haas AJ, Vepa Y, Lindqvist D, Chen H, Thomas PM, Brundin P, Brundin L, Labrie V.
Journal: Science Translational Medicine, 2018, 10, 465, eaar5280. The report caused a great deal of media activity (for examples, click here, here, here, here, here et al and here). In fact, it has been a while since I have seen such a response to a Parkinson’s-associated research report (I think the Exenatide results was the last such media circus – click here to read more about that). What has the new study found? That the human appendix contains an abundance of the misfolded form of alpha synuclein protein and that removal of the appendix decreases the risk of developing Parkinson’s. Interesting. 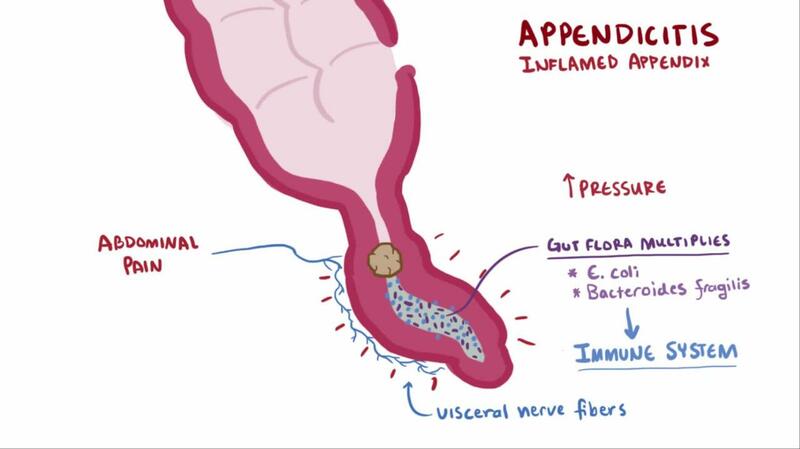 What is the Appendix? The human appendix is a small (averaging 9 cm in length) tube attached to the beginning of the large intestine. The appendix was long considered functionless, a bit of an oddity, and by some an mistake or accident of evolution. More recently, however, a new image has started to appear with regards to the appendix. It is believed to be a ‘storehouse’ for bacteria, which can repopulate the digestive system after illnesses. It also houses an abundance of infection-fighting lymphoid cells, which suggests that it plays an important role in the immune system. But if we are completely honest, we really don’t know what the appendix does. Seriously, we really don’t know. But what happens when people need their appendox removed? The surgical procedure to remove the appendixn is called an appendectomy. It is generally a emergency surgery, that’s performed to treat appendicitis – which is an inflammatory condition of the appendix. Appendicitis is typically caused by a blockage of the hollow portion of the appendix. This blockage results in a build up of pressure and decreased blood flow to the appendix, and bacterial growth inside the appendix will cause an inflammatory response. Left untreated, an inflamed appendix will eventually burst spilling its infectious materials into the surrounding abdominal cavity – the consequences of which can be serious: in 2015, 50,000 people around the world died of appendicitis. So what did the new research report find? The reseachers began their study by looking for any association between appendectomies and Parkinson’s. 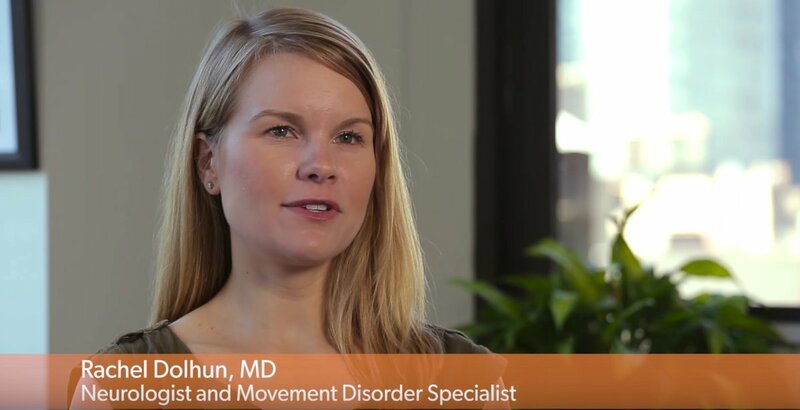 the Parkinson’s Progression Markers Initiative (PPMI – sponsored by the Michael J Fox Foundation). Their analyses suggested that an appendectomy was associated with a lower risk of developing Parkinson’s. 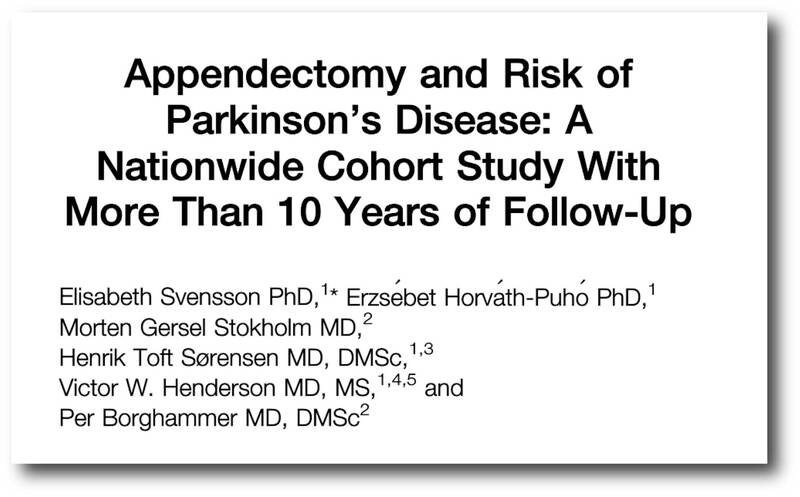 In the large Swedish database (which included 551,647 individuals who had an appendectomy), there was a 19.3% reduction in the incidence of Parkinson’s. What was particularly interesting in this result is that the researchers noticed that this effect was largely due to people living in rural areas, where an appendectomy decreased the risk even further (a 25.4% reduction). And for people living in urban areas, an appendectomy actually had little effect on reducing one’s risk of developing Parkinson’s. The investigators concluded that since rural living is generally considered to be associated with a higher risk of developing Parkinson’s “these findings suggest that appendectomy influences environmental risk factors for PD, specifically for individuals living in rural environments“. In addition, in both of the datasets, they found that the earlier an appendectomy occurred, the longer the age of PD diagnosis was delayed. Next, the researchers looked for signs of alpha synuclein aggregation in the appendix. So the researchers looked for this protein alpha synuclein in the appendix? 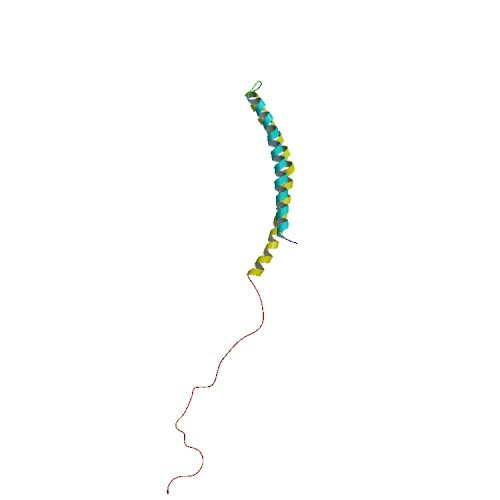 They collected samples of appendices from normal, healthy individuals, and when they looked for alpha synuclein, they found a lot of the Parkinson’s-associated oligomer form of the protein. This is the aggregated form of the protein – very similar to the form of the protein found in the Parkinsonian brain. Remarkably, they found alpha synuclein oligomers in nearly all of the cases (46 of 48 subjects examined) – please remember that all of these samples had come from people without Parkinson’s – and this effect was regardless of age – they found the aggregates in samples from people under 20 years of age, and also over 80 years of age. Interesting. Was that all they found? No, the researchers took the experiment one step further – they collected tissue from the appendix and the brain of both healthy individuals and people with Parkinson’s. Then the researchers dissociated these samples and exposed the resulting product to a solution containing normal monomeric alpha synuclein. They then left these mixed solutions for up to 48 hours and watched what happened to the normal monomeric alpha synuclein. Interestingly, the samples from healthy and PD appendix showed an accelerated formation of alpha synuclein oligomers over time when compared to the solutions containing the healthy and PD substantia nigra samples. These results suggest that the appendix contains a most potent form of oligomeric alpha synuclein than the brain. Is this the first time anyone has looked at the appendix and Parkinson’s? There have been a number of studies investigating this. And what is the consensus regarding an association between the appendix and Parkinson’s? It all kicked off in 2014, when one research group looked at tissue of the appendix from normal people and they found something interesting. The researchers looked at biopsies of the appendix from 20 normal people (no history of Parkinson’s). In all cases they found high levels of alpha synuclein in the nerve fibres surrounding the appendix. And curiously, when they looked at other areas of the intestinal system, they found little or no alpha synuclein. Which fits with the findings of new study right? And then another group of researchers took a large cohort of people with Parkinson’s and asked which of them had ever had an appendectomy (removal of the Appendix). Journal: Mov Disord. 2015 Sep;30(10):1404-7. Of the 295 people with Parkinson’s involved in the study, 34 were found to have had an appendectomy. There was no significant difference in age of onset across the entire group of people involved in the study, but in people with late onset Parkinson’s (after the age of 55 years) the authors found that found evidence that an appendectomy significantly delayed the onset of Parkinson’s symptoms. Which also fits with the findings of this new study, right? Journal: Mov Disord. 2016; 31(8):1243-7. The researchers involved in this study looked at the medical records of the 14 million (that is a big number!) residents of Ontario (Canada) who have health care insurance. They found 42,999 had undergone an appendectomy. When the researchers compared people with appendectomies with people without an appendectomy (the control group) and people who had a cholecystectomy (removal of the gallbladder – a surgical control group), they found no difference what -so-ever in the risk of Parkinson’s. The researchers concluded that their data did not support an association between mid to late life appendectomy and Parkinson’s. Ok, that’s a big study. 14 Million people. So there is no association then? If you are a regular reader of this website, you should know by now that nothing in this game is simple. In this study, the researchers used the Danish medical and administrative registries to assess the question ofwhether there is an association between appendectomies and risk of Parkinson’s. Between 1980-2010, the investigators identified 265,758 cases that had had an appendectomy (as determined by the operation code). They then matched these with 1.3 million cases from the general population (who had not had an appendectomy). When they looked at the number of people in each group who went on to develop Parkinson’s, they found that appendectomies was associated with a subtle INCREASE in Parkinson’s risk 10 or more years after surgery. Title: Appendectomy and risk of Parkinson’s disease in two large prospective cohorts of men and women. Authors: Palacios N, Hughes KC, Cereda E, Schwarzschild MA, Ascherio A. Journal: Mov Disord. 2018 Sep;33(9):1492-1496. Using data from the Nurses’ Health Study and the Health Professionals Follow-up Study, these researchers found “limited to no association between appendectomy and Parkinson’s disease risk”. So there is no association? I’m not saying that. All I am saying here is that there has been previous research on this topic and the results are mixed. And the researchers in Michigan acknowledged this in the discussion of their report, highlighting the strengths and weaknesses of the previous reports as well as their own study. But the use of two independent databases in this new study does strengthen their position. Well, it means that my appendix is staying where it is for now, and I would hope that the individual who emailed me will also not be seeking an appendectomy. This is only an association, not a direct causation. 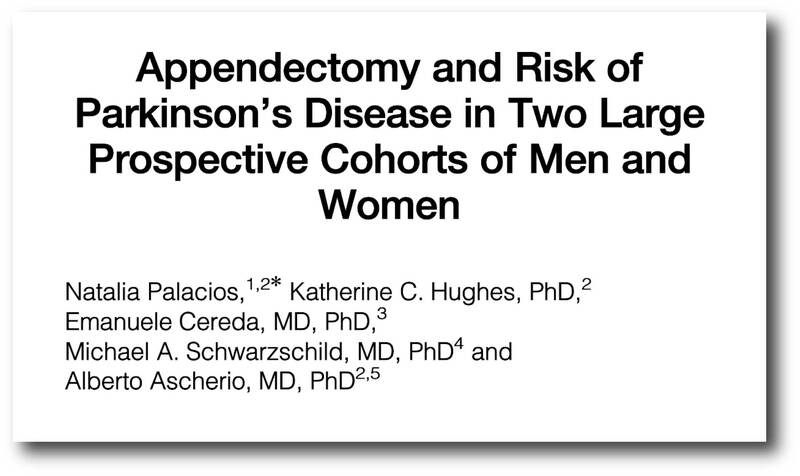 Just because there is a reduction in PD risk in people with appendectomies does not mean that having your appendix removed will decrease your chances of developing Parkinson’s. The data just suggests that there is an association. The really interesting aspect of the new research report is that misfolded oligomeric alpha synuclein was found to be so abundant in the (non-Parkinsonian) appendix. This finding raises a lot of questions regarding the function and nature of this protein. But it also points towards the use of compounds which limit the accumulation of oligomeric alpha synuclein in the appendix and other areas of the gastrointestinal tract as a potential future therapeutic strategy for PD. That said, it will be interesting to see the results of the ongoing RASMET study which is a clinical trial evaluating safety and tolerability of ENT-01 – a compound that almost complete suppresses the toxic effect of alpha synuclein. ENT-01 can not enter the brain, so Enterin Inc (the company conducting the trial) are focusing on the gut and constipation. 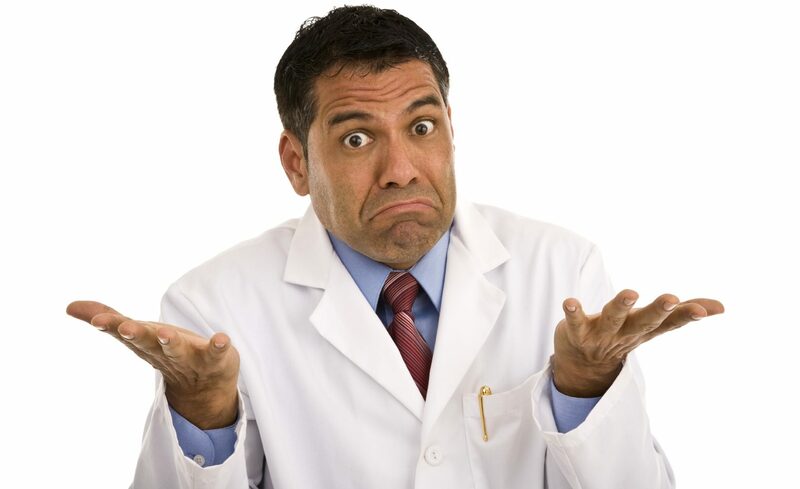 But until those results are available and we have further association data regarding the appendix, let’s refrain from ordering any appendectomies folks. Never let the facts get in the way of a good story; the BBC Radio4 midnight news reported that those with an appendectomy had a 25% lower chance of getting Parkinson’s ….The full academic report makes it quite clear that this is not true. Only for those living in rural areas in Sweden was this asociaton found;… for urban dwellers the result was nil. 0% ….. so over the total combined populaton the result was ~19% .A misleading figure to quote! Thanks for your comment. What you say is very true, and I have edited the text in this post to reflect it better. The figure stated by the media is very misleading, which is a shame because the rural aspect is possibly the most interesting insight of the epidemiological data. Like the column states; we still don’t know all that much about the functions of the appendix, and what it might be doing to or for us. Just when we think we have our evolution figured out, we find that we don’t understand it as well as we thought. Still, the article does make me feel ever more optimistic about what the smart guys and gals are discovering each day about the degenerative processes going on in our bodies, and how to delay, treat, or maybe even cure them. The majority of people fear dementia more than any other disease of age. Moving a bit more slowly is one thing as one gets older. Forgetting one’s spouse is quite another. I’m all about increasing our health spans. Eat less sugar, get off that couch, and go do something interesting! Oh, and be sure to send thanks to Simon! Thanks for your comment. I too am all about increasing the health span… it’s just that part about giving up sugar that my sweet tooth has trouble with. November 6, 2018 - 9:52 am Lou T.
I was able to cut the last bit of refined sugar from my diet by using monkfruit extract as a sweetener. It has a glycemic index of zero. I don’t crave sweets generally, but dark chocolate was my one exception. So now I mix organic cocoa powder with unsweetened almond milk and monkfruit extract, and mix the resulting chocolate milk with decaf for dessert to satisfy my chocolate requirement. Over the course of the last year my A1C declined from 5.8% to 5.6% as a result of removing chocolate made with sugar from my diet. Simon, this was another great blog! When comparing to other epidemiological studies there are several variables one should consider. First, the sample size – smaller cohorts are not powered to detect an effect of only 20-25% change in risk. Second, the follow up time. This is crucial, because if one only follows people for e.g. 5-10 years, they are unlikely to be at an age when PD risk is high (or they had the appendix removed as adults, when it is too late). Third, the environmental and lifestyle factors (pollutants, pesticides, diet, coffee, smoking, etc) that are at play in “rural Sweden”, can differ significantly to those affecting e.g. US nurses. Fourth, one has to be open to the possibility that there are genetic differences between Swedes and other studied populations, that impact the role of the appendix. It would be interesting to create a table where all these factors are described for the different studies. November 6, 2018 - 10:22 am Lou T.
Anyone who would have surgery just to remove a risk factor for a disease is, IMVHO, taking their science with too little salt. And this post perfectly explains why we should always look twice before acting on the latest scientific information. Anyway, most of us here are dealing with illness that is already established. So while an ounce of prevention is worth a pound of cure, that’s not the case if you already have the disease. November 11, 2018 - 3:40 pm Lou T.
OK, I have a highly speculative, and somewhat general, hypothesis regarding the interaction of the pesticide exposure that would be the main difference between the rural and urban populations, and the aggregated alpha-synuclein found in the appendix, apparently in virtually everyone who *has* one. Pesticides are believed to do direct damage to neurons – perhaps by damaging mitochondria and/or mitochondrial migration across microtubules within neurons, at least according to some articles earlier this year. Such damage makes those neurons more susceptible to death. 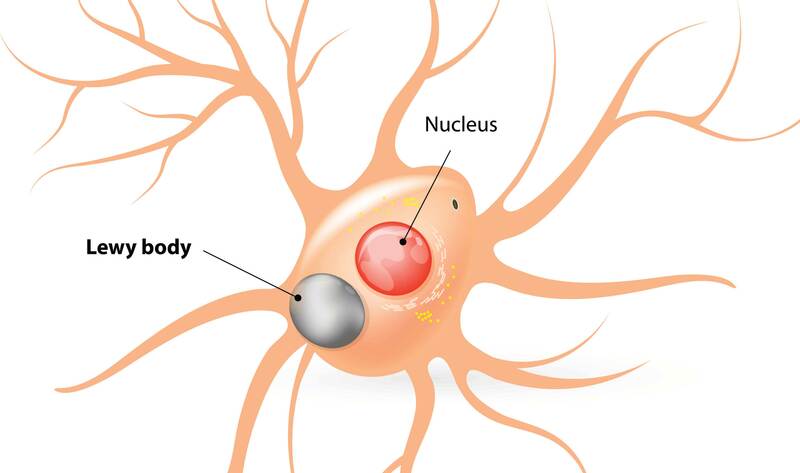 Once a sub-population of neurons dies from direct pesticide exposure, the alpha synuclein and neuromelanin inside them are released into the inter-cellular environment, potentially activating microglia, which then may start to attack the remaining neurons, tipping the balance away from survival for those neurons, which die and release more alpha synuclein and neuromelanin, thus starting a destructive autoimmune process that can persist beyond the interval of direct pesticide exposure (or can persist between multiple direct exposures). This kind of a feedback loop becomes self sustaining at a certain threshold level. Thus, it is sensitive to the degree to which propagation of effect occurs at each point within the loop (death of neurons, activation of microglia, triggering of apoptosis by cytokines released by the activated microglia, further death of neurons, etc.). For example, if mitochondria are compromised, causing neurons to have less energy with which to defend themselves, and thus to die more easily, that increases the potential for feedback to continue. Of particular salience to this hypothesis is the idea that if microglia are hit with more toxic (aggregated vs. monomeric) forms of alpha-synuclein from dying neurons, that could increase the likelihood that the effluent released by a certain number of neurons dying from pesticide would be sufficiently potent to trigger microglia for another round of cytokine release, perpetuating the cycle. So, if aggregated alpha synuclein has been migrating out of a reservoir of that substance in the appendix, up the vagus nerve, and has slowly spread through the brain until it finally reaches the substantia nigra area, at that point, in some cases, it may tip the balance between an autoimmune loop that sustains itself even in the absence of continuing pesticide exposure, and one that does not. So, people who have had their appendixes removed at an early age, are less likely to have aggregated alpha-synuclein slinky-ing through their neurons, eventually getting to the substantia nigra. There can still be some people who develop PD solely based on monomeric alpha-synuclein plus neuromelanin (for example, people whose immune systems are already hyper-vigilant due to immune issues elsewhere in the body), and there may be other routes through which aggregated alpha-synuclein gets into the brain (e.g., through the olfactory bulb), but for a certain sub-group of patients, the alpha-synuclein originating from the appendix could make the difference between a self-propagating autoimmune cycle that continues to grind down the population of dopaminergic neurons even once active pesticide exposure has ended, and one that gradually diminishes in the absence of continuing exposure. So, that’s my hypothesis regarding why this appendix effect was present for country mice but not for city mice. Love to hear Simon’s or anyone’s thoughts on this notion. November 11, 2018 - 3:50 pm Lou T.
Maybe one way to test this hypothesis would be to see if the population that does not have an appendix but *does* develop PD motor symptoms is notably *lacking* the development of non-motor symptoms of the illness. Because without an appendix they would be less likely to have aggregated alpha-synuclein spreading through the brain, and that would probably augur against non-motor PD symptoms like dysautonomia, constipation, etc. November 12, 2018 - 2:48 am Lou T.
Thank you! I found an author’s copy on ResearchGate and will be attempting to absorb it imminently.